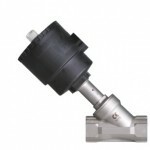 Looking for an equivalent to Schubert & Salzer Angle seat valve? The Angle Seat Valve is a 2/2-way pneumatically actuated piston valve for liquids, gases, steam and some aggressive fluids (vacuum services also.) The superior design of the piston is unique to the market, enabling the plug to retract farther from the flow path, ensuring the highest flow capacity. The dual packing design, and a large diameter self aligning stem insures the highest cycle life. A full range of accessory items are available including limit switches, solenoid valves, manual override devices, stroke limiters. This entry was posted in Installation and Training. Bookmark the permalink.